Carpenter, who grows greens and raises livestock on a dead-end street in the ghetto, is the author of Farm City: The Education of an Urban Farmer. For the past decade, the 38-year-old has cultivated land in the city, the last six years on GhostTown Farm, the sunny, squat lot in Oakland, California next to her rundown, coral-colored flat — complete with a back porch covered in goat poop — where she lives with mechanic boyfriend Bill and a menagerie of her so-called edible pets, including rabbits, chickens, and, on occasion, a turkey or two. A child of back-to-the landers, Carpenter has received stellar reviews, most notably in the New York Times, for chronicling her exploits in the urban jungle. An excerpt from the book — some 15 pages on raising pigs and learning the craft of charcuterie — fills the August food issue of San Francisco magazine. She’s been featured everywhere from mainstream outlets like Time, foodie circles, like Culinate, and eco-green arenas like Grist. Not bad for a first-time author. 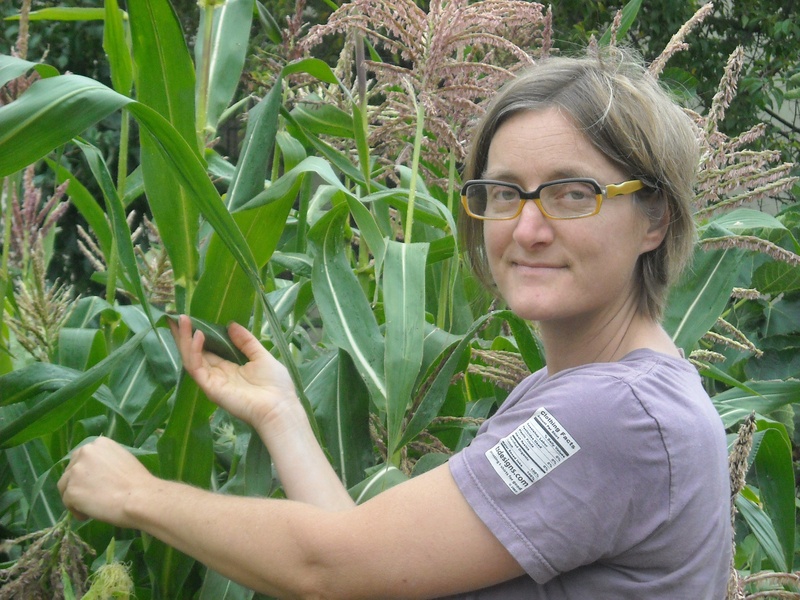 For those of us who have a hard time growing veggies in the backyard, a big part of her appeal may simply lie in knowing that a modern day urban homesteader like Carpenter is out there doing her thing, day in and day out. She’s a fixture in the ‘hood, along with hookers, dealers, homeless dudes, and kids who stop by to visit the animals. Her Cuban neighbors take care of the farm when she’s away; the Yemeni liquor store owner down the block offers advice on goat husbandry pulled from his earlier life as a goat herder. Talk about community. I admire Novella’s moxie, and I suspect others do too. I’m not much of a meat eater, but the fact that she buys these farm animals and learns as she goes, in true D.I.Y. fashion, how to raise them and get them on the table for dinner is pretty impressive. Plus, just like me, she really doesn’t like rats, an unfortunate fact of life for an urban farmer. Novella estimates that about half of her food comes from her farm and she sells some of her animals to fancy pants restaurants that want well-fed, farm fresh meat on the menu. But the girl isn’t raking it in, with animal expenses, vet visits, and seed and feed costs this is a labor of love not a moneymaking venture. The advance for her book, for instance, promptly paid for a milking goat. So when she’s not tending her farm, Novella divides her time between writing, she’s currently at work on a how-to book for folks intrigued about urban farming, and running a biofuel station, the Biofuel Oasis in Berkeley, where she’s one of the owner/worker biodiesel divas. It may well be the only fueling station around that holds classes on raising chickens and bees in close quarters. Curious to learn more? If you live in the Bay Area, check out Novella on the farm in person on Saturday, August 29, during Oakland’s Eat Real Festival next weekend. She’ll give farm tours, sign books, teach workshops on slaughtering chickens and raising goats, and harvest food to share. Oh, and she has a trio of dwarf goats for sale. Anyone game? You’ve done ruined it for the rest of us who are positively awestruck at her success and can’t wait to see her in action next Saturday. The more the merrier I guess. Thanks for the heads up!! Excellent post. Hope it won’t be too much of a zoo there (oxymoron? ), as I plan to go too. I love reading about these phenomenal individuals – so near to me. Oakland is an interesting town. I’ll have to buy Novella’s book. Wonderful. Can’t wait to read it. Just finished Novella’s book. I was curious to see if the plot next door had been sold, as it was up for sale towards the end of the book. Glad to see she is still at it and has even added a goat. You go, Girl. Yes, Novella is still at it, milking her goat, Bebe, while she listens to NPR. Superb website. You have earned a new fan. Please maintain the great posts and I look forward to more of your intriguing updates. Next post: White House Farmers' Market: An Idea Whose Time Has Come?